JCP1 - What can it do? JCP1 - A Java based DIY robot! So it wont wash your clothes or take out the trash... yet! :) JCP1 is all about getting there and not really about what it can do, although my goals for this project is much more ambitious than the average remote controlled tin box on wheels. So the important thing here is to give it some autonomous operation as well as some remote control in addition to being an information servant. Naturally, the practical things it can do is quite limited simply because it cannot reach out and grab anything yet. A hand might be added at a later stage, and in thats first iteration I dont expect it to do much more than grabbing and holding light weight objects. However, there is still a number of things that it can do in its present state, and this will grow with every software update I do. In its present state its more of a software agent on wheels than a real robot, but I am constantly experimenting with different ways of making it useful. The idea is to make it a usable assistant in many simple tasks. Software OS: Windows XP. Code: Java and JNI to OpenCV. - Modular system with i/o processors and behaviours, using an event driven engine. I2C bus communication with devices. 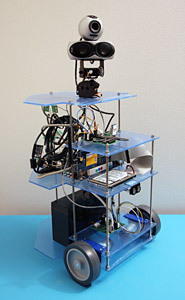 Connects to remote RoboRealm server for vision processing. Wii game controller support for remote control. 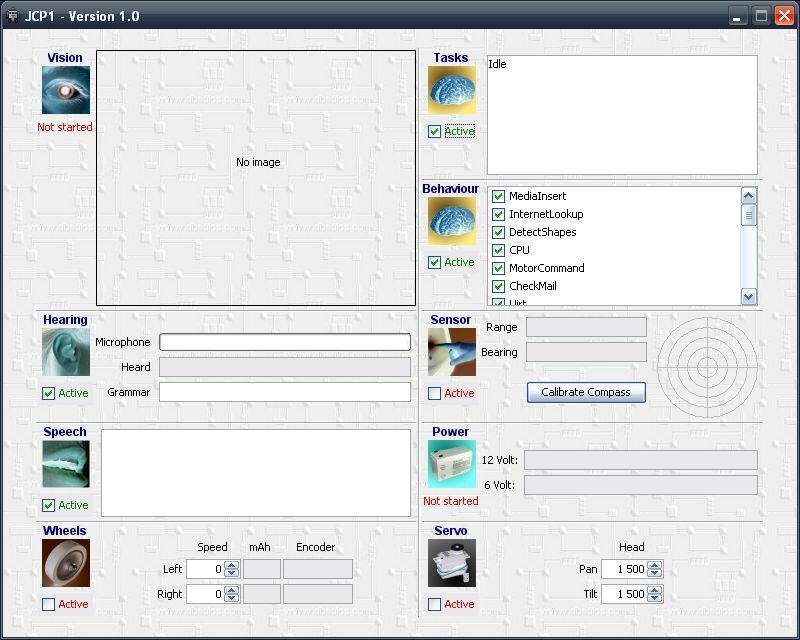 Can connect to JCPServers to access screen, media and use distributed applications for e.g. vision processing. Speech recognition uses grammars with variations so you can e.g say an optional "please" before sentences etc. You can control the robot with a Wii game controller. Checks your email from a pop3 server when you ask about it. Can operate the TV using an Uirt module. Turn on/off, change channels, mute, etc. A general calendar feature where you can add appointments, birthdays, events. Robot will inform a day/hours before event starts. Adjust volume of remote media server based on hand gestures. Generally find solutions to communicate with robot when room is filled with sound/music. Ask it to follow you and it will detect color of your shirt (after face has been seen) and use that as basis for tracking. In idle mode it should scan for motion and look upwards at highest motion area and see if can locate a head.